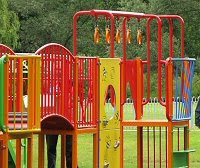 During this evening's meeting, Rachael saw two playgrounds, they were typical children's playgrounds with all the usual equipment. One of then had a notice that read, 'If you want to play, you have to pay', and it was full of children. The other playground had a similar sign but it read, 'This playground is free'. But there were only a few children playing there. And then she saw that there was a small gate between the two playgrounds and some people were moving from the paid playground to the free one. Jody saw a flagpole with a huge flag fluttering in the wind. As she looked it changed into a myriad different colours, as if all the flags of the world were mixed up but coming to the fore one by one. Rachael received the single word 'unravelling'. She understood that the Lord is unravelling us as we live our lives. He moves us forward in his plan, sometimes it may not be a comfortable process, but in the end we need to be unravelled so that we can be remade in the image of the Son. Jody spoke about judging ourselves, and then Chris shared a picture of ice floating on the ocean. The ice was massively jammed and because it was so tightly packed none of it was able to move. As he watched, he saw that the ice was melting. Yahshua is melting us and we will become free to move!